I'm going to Paris this spring and would rather save my money for shopping there then here. (Have you entered my $25 Amazon.com Gift Certificate Giveaway? Just click here and tell me what I should pack for Paris.) Still, I do need a few things, like comfortable footwear. This weekend, a bunch of shoe sites are having sales, so I decided to see what was available online. I started out looking for sensible walking shoes, but was instantly distracted by the many lovely spring flats in gorgeous colors. We got off easy weather-wise this winter in the Northeast, but still, I'm ready for spring and its fresh colors. Here's sample of flats in daffodil yellow, tulip purple, and new grass green. Not all the styles are on sale and one or two might require a splurge. 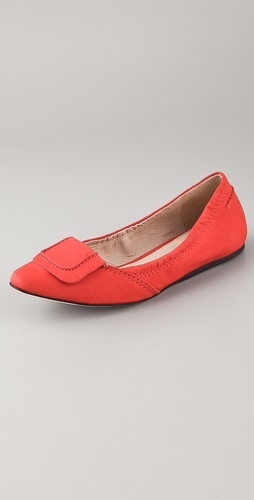 But most, like the Anne Klein Seana Casual Flat ($69) above, are well-priced or even low-priced (under $25). They make this over 50 woman want to pull out her white Capris or white jean skirt and put on a pair. My first online stop was Nine West because of its advertised sale on round toe pumps, which includes a few flats. If you're reading this before March 6th, click any of the photos below to see the full selection of styles and colors, many reduced up to 30%. And, lastly, the Nine West Clarence boat shoe (was $79.00, now $59), a traditional boater in sunny yellow. Shoe Mall is offering savings on its entire collection this weekend. If you're reading this before March 7th, click on the shoe photos to view full selection and receive $20 off $80, plus free shipping. Yes, yes--I'm aware that this next style is a sandal, not a flat. But the color just knocked me out and I had to share. I'm loving this next luscious blue Nubuck flat. It's also available in an equally rich orange. Two-tone shoes are in style again this spring. This Easy Spirit Radiance Comfortable shoes for women ($85), with the delicate cut-out details, is awfully pretty. It's not on sale, but there is a 25% off sale on new arrivals through March 7th. It's hard to beat Old Navy for low-priced shoes. The other great thing: the product reviews. Old Navy shoppers love to tell others how they feel about the site's products. I find that a big help. Here are a few flats that have gotten good customer feedback. Navy will always be a spring color in my mind. I'm loving these retro loafers in navy. They're also available in bright yellow. These next Old Navy Women's Ballet Flats ($22.94) are also available in the most gorgeous turquoise. To view them and other Old Navy flats, click on shoe photo below and then click on "Ballet and Flats" in the left-hand margin under "Shoes and Slippers." I know women who will scrimp on everything in the wardrobe, so they can splurge on shoes. If you are one of those women, you might like these next very sophisticated Elizabeth and James Kimi Hidden Wedge Flats ($198).